Binary Stars Are Two Stars Orbiting Each Other In The Universe. Binary star is one star orbiting another star. A binary star is a stellar system consisting of two stars orbiting around their center of mass. For each binary star, the other is its companion star. Recent research suggests that a large percentage of stars are part of systems with at least two stars. Binary star systems are very important in Astrophysics, because observing their mutual orbits allows their mass to be determined. The masses of many single stars can then be determined by extrapolations made from the observation of binaries. Classifications of binary stars by methods of observation. Binary stars by configuration of the system. 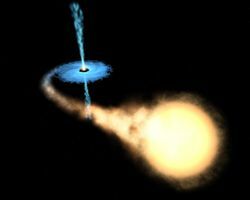 artist's impression of a cataclysmic variable system. Binary star formation and evolution. 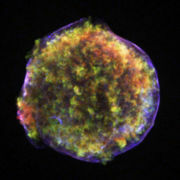 Binary star mass transfer and accretion. Binary star: Runaways and novae. Binary star use in astrophysics. In a binary system, the more massive star is usually designated 'A', and its companion 'B'. 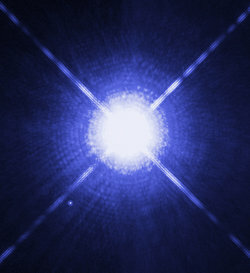 Thus the bright main sequence star of the Sirius system is Sirius A, while the smaller White Dwarf member is Sirius B. However, if the pair is very widely separated, they may be designated with superscripts as with Zeta Reticuli (?1 Ret and ?2 Ret). 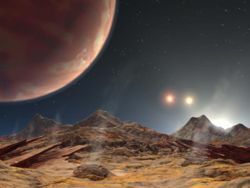 Research findings into binary stars. 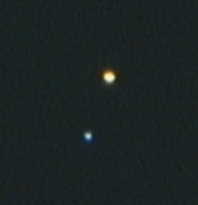 The large distance between the components, as well as their difference in color, make Albireo one of the easiest observable visual binaries. The brightest member, which is the third brightest star in the constellation Cygnus, is actually a close binary itself. Also in the Cygnus constellation is Cygnus X-1, an X-ray source considered to be a black hole. It is a high-mass X-ray binary, with the optical counterpart being a Variable star. Another famous binary is Sirius, the brightest star in the night time sky, with a visual apparent magnitude of -1.46. It is located in the constellation Canis Major. In 1844 Friedrich Bessel deduced that Sirius was a binary. In 1862 Alvan Graham Clark discovered the companion (Sirius B; the visible star is Sirius A). In 1915 astronomers at the Mount Wilson Observatory determined that Sirius B was a White Dwarf, the first to be discovered. In 2005, using the Hubble Space Telescope, astronomers determined Sirius B to be 12,000 km in diameter, with a mass that is 98% of the Sun. Algol is the most famous ternary (long thought to be a binary), located in the constellation Perseus. Two components of the system eclipse each other, the variation in the intensity of Algol first being recorded in 1670 by Geminiano Montanari. The name Algol means "demon star" (from Arabic al-ghul), which was probably given due to its peculiar behavior. Another visible ternary is Alpha Centauri, in the southern constellation of Centaurus, which contains the fourth brightest star in the night sky, with an apparent visual magnitude of -0.01. This system also underscores the fact that binaries need not be discounted in the search for habitable planets. Centauri A and B have an 11 AU distance at closest approach, and both should have stable habitable zones.